Puppetry is an expressive art form involving manufactured characters, which in the case of sock puppets, are made from socks embellished with faces, hair, and accessories such as hats, cigars, mustaches, eye glasses etc. Sock puppets are a form of puppet that can be manipulated with only one hand, allowing the puppeteer to use the other hand for a second puppet or to control stage items. Typically a sock puppet stage will be the size of a table, and may involve as many as nine or ten puppets on stage at any one time. As long ago as the 11th century BC puppets were being used in India, quickly spreading to other parts of Asia, and were used as devices to give morality stories a visual impact that words alone couldn’t convey. Puppets have throughout history been used to represent good, evil, jealousy, and greed without running the risk of identifying individuals who might exact revenge against the storyteller. In ancient India puppets were constructed from carved sticks, and were often elaborately decorated, whilst in China and Japan in the middle of the first millennium BC puppets were being intricately carved from wood. Socks, whilst having been identified as being a form of footwear for thousands of years, initially started as matted animal hair shaped to fit inside a shoe or around the foot and ankle in a similar way to felting wool. The ancient Greeks were known to have used this technique as far back as 750 BC, whilst the Romans innovated with thick fabrics that were wrapped around the legs to form a shaped sock. The Roman sock wasn’t a terribly brilliant innovation but continued to be eveloped after the collapse of the Roman empire and in the 5th century AD became known as a puttee, a roll of thick white fabric men of the church wore to symbolize their purity. Knitting was invented by in Egypt during the 12th century AD by nomadic sheep herders who would create fabric through the simple use of knotting the wool yarn using straight twigs. The technique had very real advantages over traditional weaving and allowed any shepherd and his wife to produce a more valuable product instead of just selling their wool. the practice quickly spread from Egypt throughout the Middle East and into Europe. Almost immediately, Muslim knitters in Spain started developing a variety of knitting stitches that allowed them to create shaped fabrics, the sock being one of the first knitted items of clothing to be produced, though we have no evidence to suggest medieval shepherds or knitters would have used socks to create puppets. Certainly, historians know that patterned socks were being made as far back as the 1200s, and were decorate with complex chevrons and Arabic verses. We can speculate that sock puppets may have been invented around the same time. Knitted socks until the Renaissance era were the almost exclusive preserve of the wealthy who could afford to buy them, yet in 1589, William Lee of Calverton in England invented the first knitting machine which overnight transformed knitted garments into something almost everyone could afford to purchase. Knitting is credited with transforming the textile industry and being the precursor to the industrial age. A few years after Shakespeare’s death, the puritan movement in England was gaining momentum, and traditional puppetry was banned along with all other forms of theater. During these dark years in England and France, radicals who yearned for the freedoms they had known before the rise of the puritans would organize secret theater shows, but were often forced to use puppets since these were easier to transport and conceal than sets, costumes and large bands of actors. Even then, some were still arrested and imprisoned or tortured. Socks and very basic stages made of suspended fabric hung behind a table became a popular way of getting around the ban, and led to the first recorded sock puppet shows. It was around this time that the puppet character Punch was created, though many believe the traditional Punch and Judy shows were created much later. 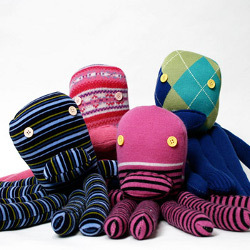 These puppets were originally brought to life as sock puppets, it being too dangerous to display a full sized puppet. Revolutionary puppets have a long history from those puritan times right through to Napoleonic times, with puppet shows often banned because the puppeteer was an itinerant who would attract homeless and revolutionary audiences into respectable public squares. After the return of the monarchy and the end of puritan times Punch and Judy puppets became more commonly associated with glove or hand puppets, though amongst children the ease of using a discarded sock that could be decorated to mimic a hand puppet ensured that sock puppets continued to be popular, though restricted to amateur performances in the family home or playground. In contemporary popular culture sock puppets have been extensively used in television shows, possibly the most famous character being Lamb Chop, a sock puppet invented by Shari Lewis for a WNBC show ‘Hi Mom’ which screened in 1957. Over a 40 year career, Lamb Chop went from local character to national syndication, and then to her own PBS show “Lamb Chop’s Play Along”. In 1997 MTV broadcast a show entitled The Sifl and Olly show which despite attracting a loyal fan base was cancelled in 1999. 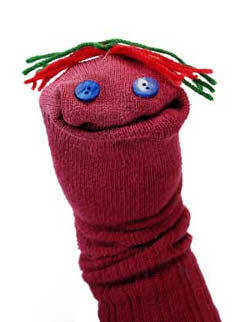 The term sock puppet is also used to describe a fictitious identity used online to promote a particular point of view or defend a person who is seen as controversial. Often a sock puppet in this context is used to attack the author’s own opinion or a set of principles in the hope that other moderate users will come to their defense. Sock puppets are widely seen as undesirable and on major community based sites such as Wikipedia, Wikimapia, and other high profile forums actively hunt down and ban sock puppets along with all other accounts of their creator. subscribe for a blog web site? The account aidsd me a applicable deal.